Arr, me hearties! 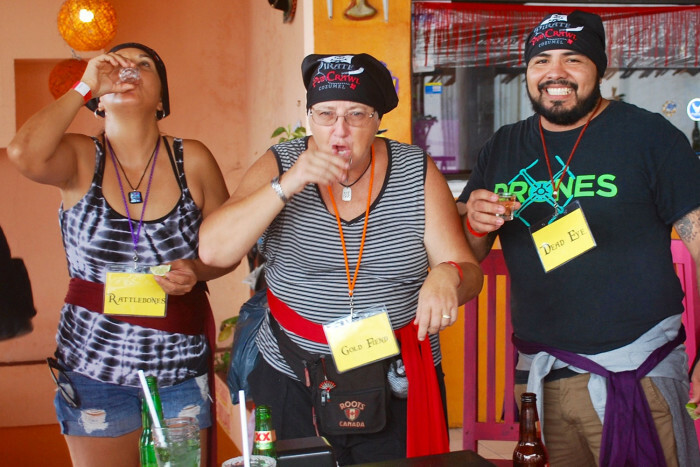 Drink your way round Cozumel with a bunch of rowdy pirates. This tour takes you to 4 of downtown Cozumel's favorite pirate hangouts. Enjoy a full meal at the second stop and plenty of free drinks along the way. And if you want to avoid walking the plank you'd better get yourself ready for some tequila tasting too. If you prefer a pirate tour that includes snorkeling too, take a look at our Pirate Boat Snorkel Tour. 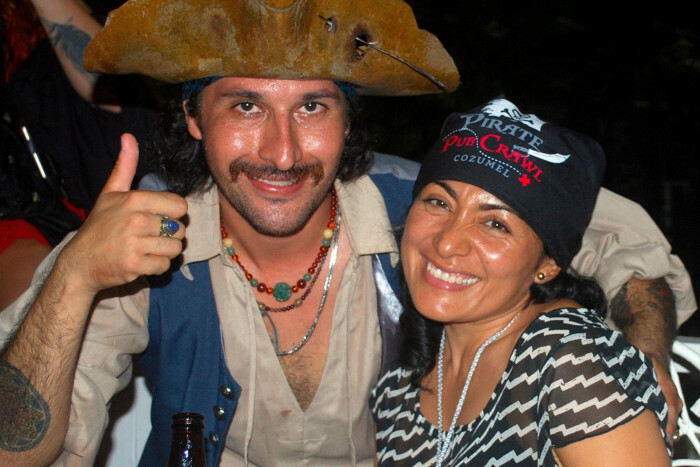 Or if you'd like to dine with pirates on a boat, check out our Pirate Dinner Cruise. 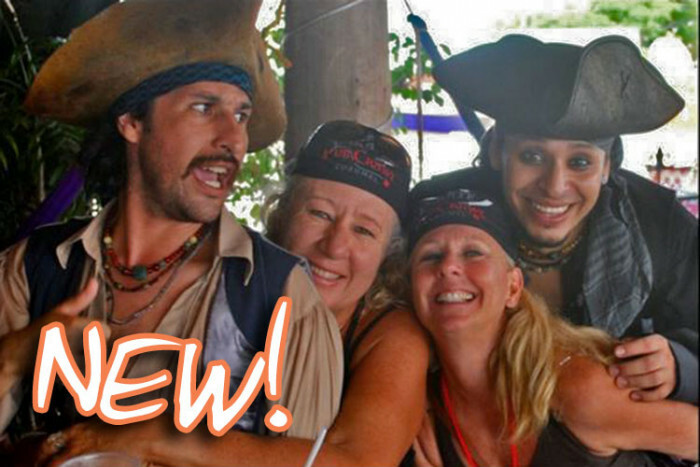 "We loved our Cozumel Pirate Bar Crawl! We had more than enough liquid refreshment and the pirate guides are fun and knowledgeable. Highlight of our second day in Cozumel"
Wear cool, comfortable, clothes and shoes; sunglasses; sun protection for when walking between bars (hat/sunscreen), cash for balance. Guided walking tour of 4 Cozumel bars/restaurants, free drinks in each bar and ful meal at the second stop. Beer Pirates get mostly beers to drink and Premium Pirates have drinks with rum, whiskey, vodka drinks, etc. included too. Optional gratuities; wooden legs; bail fees. This tour can be muddy, or dusty, or both, depending on the amount it has rained recently. We recommend you bring bandanas/head scarves to cover your face and/or put under your helmet in case of dust. Alternatively, they are available to purchase at the beginning of the tour. 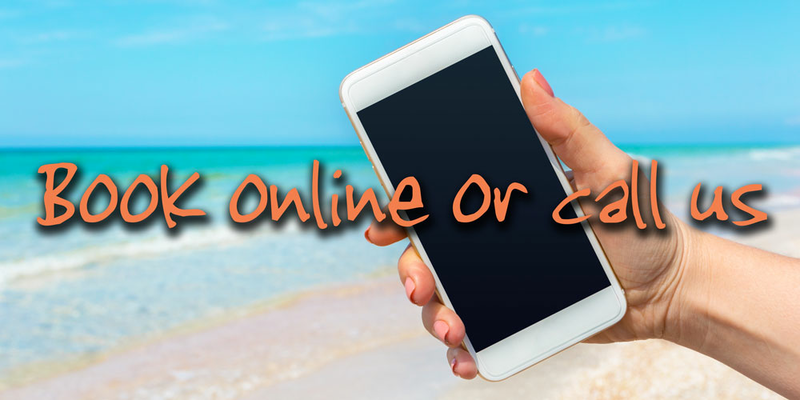 3 minute walk from the Punta Langosta cruise terminal (most Disney, Norwegian and MSC ships) or 5 minute taxi ride from the Puerta Maya terminal (most Carnival, Royal Caribbean and other ships). You will be required to sign a waiver form. Do not drink alcohol before you arrive for the tour please. Cash only accepted for balance, US dollars or Mexican pesos at exchange rate on the day.